I have a weird love slash borderline obsession with binders that began several years ago when I entered the working world. I plan to do another post in the next couple of days regarding my love/obsession and other binders that I have made, but for now I have put together a vlog (video blog) about my Home Organization notebook. If you are unfamiliar with the concept I explain it in the video. So if you care about my notebook, or want to know what I sound like in real life feel free to watch the video. 1. I'm sorry it is so long, I tried to make it short. I talk a lot. 2. I say um a lot. Too much. 3. I need a hair cut. And color. 4. The sound is off from my mouth which I think is an added bonus. It takes the attention away from how bad my hair needs attention. It took me longer than I thought it would to move Eli to his own crib, but when he was around 4 months old I decided I needed to quit procrastinating and go ahead and move him out of our room into his own room. I never would have thought that it would be hard for me, but it was. 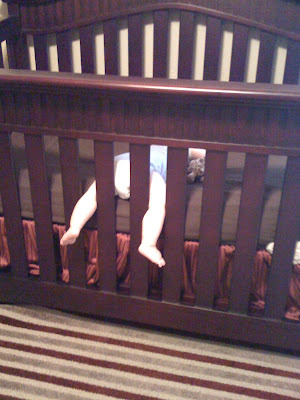 He has transitioned to his crib so smoothly and seems to love it. We did have a couple of rough nights here and there but for the most he loves his crib. 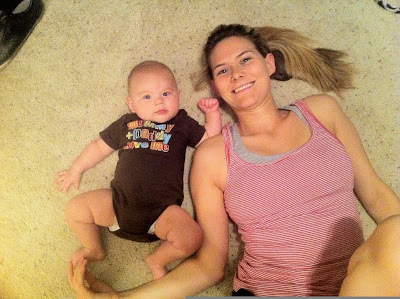 Before Eli was even born I remember seeing on my friend Jennifer's blog a post about letting her kids spend some play time in their crib. Well last week I was cleaning in Eli's room and remembered this post and thought it would be a good idea for Eli. So I put Eli and some of his favorite toys in his crib and let him play while I vacuumed and dusted in there. 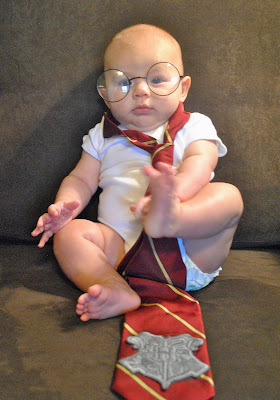 disclaimer: My child does wear something other than onesies. I feel like I only post pictures of him in onesies. I do have to say when we are home hanging out and not going anywhere he only wears onesies, they are comfortable for him. When we first moved Eli to his crib he slept with his face in the bumpers so I decided to take them out. I do know about breathable bumpers but for us just taking the bumpers out out worked. Poor baby boy!! Although I have to admit, he seemed to enjoy it and found it comfortable. I gently moved him back into his sleeping position (after snapping some pics of course) and he continued to sleep soundly. This was a couple of weeks ago and hasn't happened since, so hopefully it was just an isolated incident. 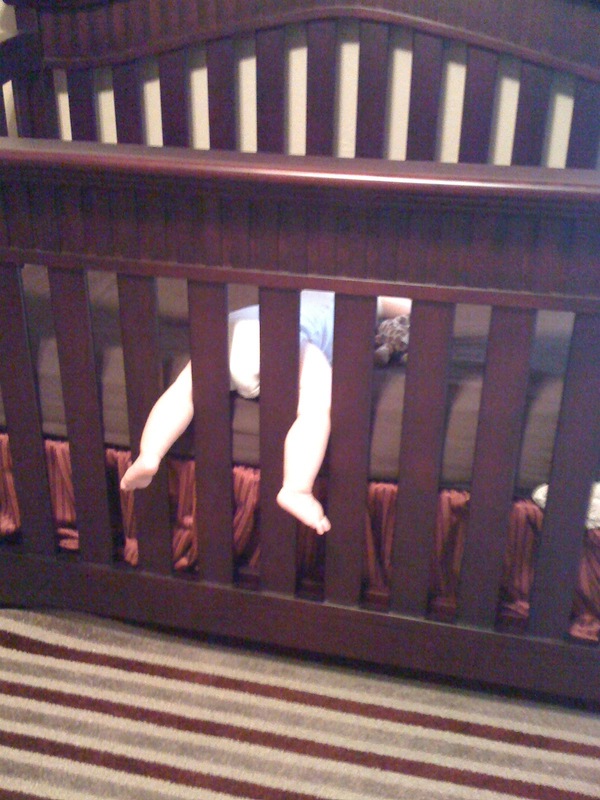 I'm glad he likes his crib and plan to let him spend some more play time in there from time to time. I want his crib to be something he enjoys and not something he dreads. I remember the first time Luke told me he didn't believe in soul mates. We were in college, dating, and it was like he stuck a knife directly through my heart. Well, maybe not quite that dramatic, but I'm dramatic so let's stick with it. HOW could he not believe in soul mates? I mean all of the movies tell us to find our soul mates, the majority of the Christian culture tells us our soul mate is out there and every song on the radio references a soul mate in some way. Of course he gave me his reasons as to why he doesn't think that soul mates were real (blah blah). I pretended to listen but really just thought he was a crazy, heartless man. Several years later I married that crazy, heartless man. He still didn't believe in soul mates and I didn't care. It was time to get married. We've now been married for three years and we still joke about our difference of opinion in this particular matter. We went to a marriage conference this weekend and listened to many wise speakers talk about marriage and the up, downs, and in betweens that entail a marriage. The whole weekend I couldn't help but think of how lucky I am that I am able to call Luke my husband. Going into marriage we had many, I stress, MANY differences, we are about as night and day as a married couple could get, but we loved each other and we had our love for Christ in common and for us, it was all that mattered. Marriage is not easy, just with anything in life we go through valleys and peaks. There will be times that I think "man, we've really got this marriage thing DOWN". And then there will be times where it is hard. Arguments come easier, emotions are more sensitive and nerves are frazzled, those are the times when we learn what being married is really all about. Each season of life we learn how to move through the leaps and bounds. Adding a baby to the mix wasn't the smoothest transition but we are learning how important communication is. We try and set aside time for us, even if it is watching a movie together after Eli has gone to sleep. Or making a specific effort to sit at the dinner table and talk about our day, no TV's or computer. Marriage is fun, hard, exciting, mundane, comical and sometimes even easy at times. But through it all I know that there is nobody else I would want to walk through life with. 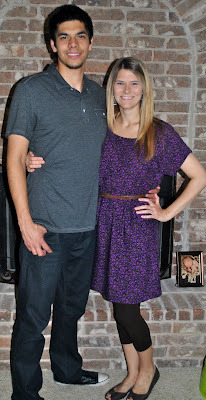 Luke is such a Godly man and does an incredible job of leading our family. He has taught me so much in the time that I've known him and is constantly challenging me and helping me grow in every way. He knows just how to push my buttons and when I act annoyed I'm really cracking up inside and I know that when I'm watching Real Housewives and he is reading next to me, he is secretly peaking over the book fully engrossed in the drama that I know and love so much. I'm so thankful I married my soul mate. Even if he doesn't think I'm his. I'm a sentimental fool when it comes to my childhood. When I hear songs, or see a TV show or movie that reminds me of my adolescent I am instantly filled with warm fuzzes and transported back to that time. I think the fact that I am so sentimental is one reason why I love everything about Disney so much, and why very single time Luke and I talk about where to go on vacation, without fail I always yell DISNEY WORLD!!!! Disney was such a HUGE part of my childhood. Growing up watching movies that were made way before my time but were and still are amazing classics. Watching the cartoons that filled my young-kid years such as DuckTales and Gummi Bears, and watching all the disney channel shows and movies through my pre-teen years. It ALL brings back such awesome memories. Do you remember when the Disney Channel was a channel that you had to pay for? It didn't come with standard cable, it had to be purchased separately. I remember specifically when my parents finally broke down and paid the extra money for it. It was the greatest thrill of my life at that time. I saw this video on this Disney blog tonight that prompted all of these memories. It's amazing how you can forget something and then when you see it, you are instantly flooded with hundreds of memories and feelings. I LOVED LOVED LOVED the made for Disney movies and would watch them all the time. Does anybody remembered "Wish Upon a Star" starring a young Katherine Heigl? This was SUCH A GREAT movie. Think "Freaky Friday" but with sisters. I loved Katherine Heigl in this movie and thought she was so pretty. The movie Susie Q was another favorite of mine. 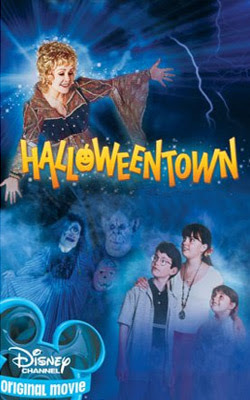 This was one that was shown on the Disney channel over and over and I don't think I ever grew sick of it. Well maybe I did at the time, but I haven't seen it in so long I couldn't imagine not wanting to watch it at this point. We all have heard about the new Mickey Mouse Club because of Justin Timberlake and Britney Spears, but I watched it long before we even knew who they were, and at that time I wanted to BE Keri Russell. I loved her so much. I wanted her hair!! And I always hoped that she would marry that Tony guy. And let's not forget Kids Incorporated! I would pretend I was on this show all the time in my backyard. I had a pretend microphone and I had marked out a trail in my backyard that was my "stage". I would walk up and down my marked out trail singing and trying to dance. I was a special kind of kid. Does anybody remember the show "Adventures in Wonderland"? This show will always remind me of when my baby sister (who is now 18) was born because my middle sister and watched it ALL THE TIME during that time. I even think we were watching it the day my mom brought her home form the hospital. 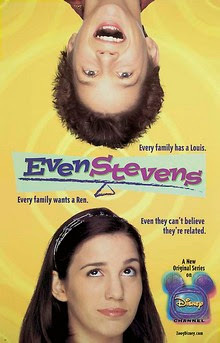 Even Stevens came several years later and was during my "I should probably be too cool for the Disney Channel but I still love it and want to watch it but I should probably hide it from my friends" stage. Sometimes I wish I could go back to my old kid self and tell myself to stop thinking I need to be cool and "grown up". Growing up will happen on its own, enjoy your childhood because it is so short. But that is a whole post in itself! And who could forget Bug Juice, the show about real kids at a real summer camp. This was my first "reality" show to watch and probably the reason why I love Real Housewives so much today. Bug Juice was the "housewives" of my teen years. And who can forget the days that the Disney Channel ran reruns of shows such as Boy Meets World, Brotherly Love, and Growing Pains. I would race home from school to watch a young but still extremely cute Leonadro Dicaprio on Growing Pains. I could go on and on recounting memories of old movies and shows but I need to reign it in somewhere. Sometimes I really miss the carefree days of being a kid and watching these movies and shows after school. I really wish Disney would have a "throw back" weekend and would show all of these old movies and TV shows. It would be so awesome! As I mentioned on Sunday, I have officially entered the wonderful world of Weight Watchers, and I'm oddly excited about this new adventure. I'm not sure how long I will do it, I'm not too far away from my "goal weight" but I love that I'm teaching myself how to limit myself and what true proportions are. For far too long I've eaten until I've had that "full as a tick" feeling and that needs to stop! Up until I popped a baby out of my body I was a girl who could pretty much eat what she wanted when she wanted. And then my metabolism disappeared when I gave birth. Not really sure how or why that happened. But it did, and I've decided not to sit around and cry about it. Anymore. I know lots of girls around here are apart of Weight Watchers so I thought it would be good to provide a place for us to share our tips, snack ideas, meal ideas, favorite websites for recipes, etc. I've only been doing WW for a couple of days so far, so I'm very open to tips and ideas. This is a good and filling snack and is only THREE points! You can eat 17 turkey pepperonis for 2 points and the string cheese is 1 point. Thats a STEAL OF A MEAL if I do say so myself! I'm a HUGE french onion dip fan. In fact several times while pregnant I would eat french onion dip out of a bowl with a spoon. I wonder why I gained so much weight? Ahem. BUT french onion dip MIX is 0 points so if you mix it with fat free sour cream it is only 1 point for 2 tablespoons. Eat that with some carrot sticks and you have an awesome healthy, low point, yet filing snack. So those are my two snack ideas to share. Becoming a parent has been hands down the most amazing experience of my life. I knew I would love that baby that was growing inside of me, but I had no idea just how much my love for him would encompass my entire being. He is growing each and everyday and becoming a little more independent. It sounds so strange to call him independent, because he still relies on us for everything, but slowly and surely you can see his little personality forming. He has started this new thing where he completely goes crazy when he sees us preparing his bottle. Sometimes, even if he didn't show any prior signs of hunger, when he sees us beginning the process of making his bottle, he will just about come out of his skin trying to get to the bottle. We will measure the water, pour the powder and shake up the bottle and the whole time he will flail his arms grunting and whining loudly trying to show us in every way he knows how that he needs that bottle right this instant. I know he can't comprehend it yet but I always tell him "Eli, I would never let you starve, never ever, I will give you this food as soon as it is ready." If I gave him the food before the formula was properly mixed it would be gross and would not give him the proper nutrition that he needed. One day when I was preparing his bottle it hit me like a ton of bricks; this is so similar to my relationship with Christ. How often is our relationship with Christ like that scenario with Eli and the bottle? God is working in our lives in some way but we do not comprehend it. The way He is pruning us and preparing us is something that we don't understand, but we know that we must wait on Him, that everything He does for us is for our best interest. We can't even comprehend why He would make us wait when WE CAN SEE IT RIGHT THERE, but He knows why. He knows what nutrition we need, why we need it and when. As we grow in our walk with Him, His voice becomes easier to decipher and sometimes even easier to comprehend. We still may not understand why He does something, but we have learned, through faith and past experiences with Him that He looks after us, He cares for us and He is leading us, even if it seems like we are at a standstill. This is where I am today. I can see God shaking that bottle and I so badly just want Him to give it to me, but it isn't ready. He still needs time. I still need time. I really don't understand why I need more time, so I'm whining and grunting and maybe even stomping my feet, but He remains true to His word "he works all things out for the good of those who love him". So even though I can't understand His ways, I can comprehend that he is a good God, a just God, a loving God, and he would never, ever, ever, leave me. He just needs to shake the bottle a little more because the ingredients aren't quite ready. Since Eli was born, Friday nights have become "date-nights-in" for me and Luke. We weren't big movie people before Eli, but now that we are stationed to our house on Friday nights because we have a sleeping baby in his crib, we have found that it is a fun thing to do together. I make it sound like we were out partying having this crazy time before Eli came. I can assure you that is far from the truth. The craziest we ever got was the night we went through the Braum's drive through on a Friday night and Luke asked what I wanted and I randomly said "A cup of hot fudge" just to see if he would order it and he did and they gave it to us. For $1.99. A CUP OF HOT FUDGE. For $1.99. That is the deal of a lifetime. It was probably some teenage kid who had no idea what he was doing or WHY anybody would want hot fudge, and freaked out and hit the $1.99 button real quick. But it totally made my night. I took about two bites and then threw it away. Who wants to eat a whole cup of hot fudge? 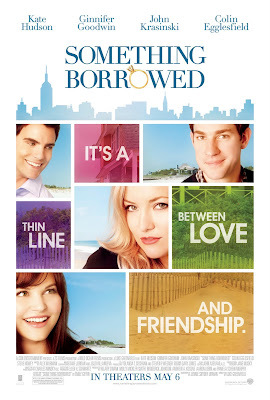 Friday we watched the movie Something Borrowed. I read this book last year on our cruise and I was looking forward to the movie SO MUCH. It came out right after I had Eli and sadly I never made it to the theater to check it out. I was anxious to see it this weekend, so I begged Luke to let us rent it from the On Demand thing on the tv. He hates spending that much on a movie but made an exception on Friday night since it was our "date night" My Prince Charming. I don't mind spending that much on a movie because when we order it through the TV it just goes through our bill so it's pretty much like it was free right? I enjoyed the movie. There were some funny moments and it was your normal cutesy girly chick flick. But as I always am, I was disappointed with the transfer from the book to the movie. Every single time I see a movie that has been adapted from a book I feel like the character development is lacking. I remember feeling this way with The Notebook and several others. But nonetheless it was a good movie and I watched it again before our reservation was up the next day. I had to get our full $4.99 worth! My man has taught me well. Sunday I joined Weight Watchers. It is something I've debated doing for awhile and I decided to take the plunge. I've actually already achieved my pre-Eli weight, but my body still doesn't look the same. I know everybody told me it would happen but it's annoying when it really does happen. 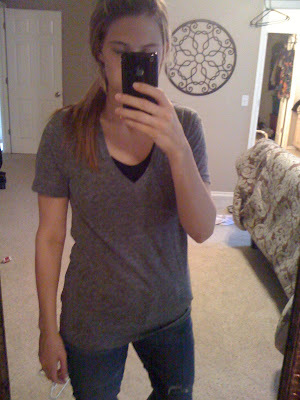 So even though I'm back to pre-pregnancy weight, I would like to fit back into pre-pregnancy jeans and pants. I need a little help from the weight and the watchers. That was a whole metabolism lifetime ago. I sure miss that metabolism. She was good to me while she lasted. We even once enjoyed cups of nothing but hot fudge together. Anyways (I always get off on tangents) all of that to say I know there are a lot of people around here who do Weight Watchers so I am going to host a linky thingy on Wednesday where we can share our favorite low point snacks, meals, or just tips for each other. I need some good lunch and dinner ideas. So if you are doing WW or you have done it in the past get your ideas ready for Wednesday. I mean it, don't embarrass me! I'm always afraid to do those linky thingys! PROVE MY FEAR WRONG. This morning I woke up to sweet sounds of Eli through the monitor, cooing and talking and laughing in his crib. I immediately thought it was so sweet that he was up for the day in a happy and chipper mood. I looked at the clock expecting to see 7:00 and instead I saw 4:00. UM that is NOT what I had in mind. I'm not sure if I mentioned it before, but my baby does not sleep a lot. He isn't fussy or cranky about it, he just sleeps a limited amount of time and then is good to go. If he came with an instruction manual it would say "This baby does not require a lot of sleep, please proceed with caution". And so I do. Even though Eli woke up in good spirits, I wanted him to sleep a bit longer, perhaps till 7:00? So I went in his room to put his pacifier back in his mouth, because that usually helps him drift back to sleep. When I got in there I saw that he was completely soaking wet, including his mattress. Can we talk about something? Why can we fly to space and also carry little devices in our pockets that allow us to access the internet from the depths of the forests in Africa (I'm not really sure of any depths of forests in Africa I'm just going for theatrics here) but we can't create a diaper that doesn't leak?!?! Its unfathomable to me!! So when I realized he was wet I brought him in our room to change his diaper and clothes. 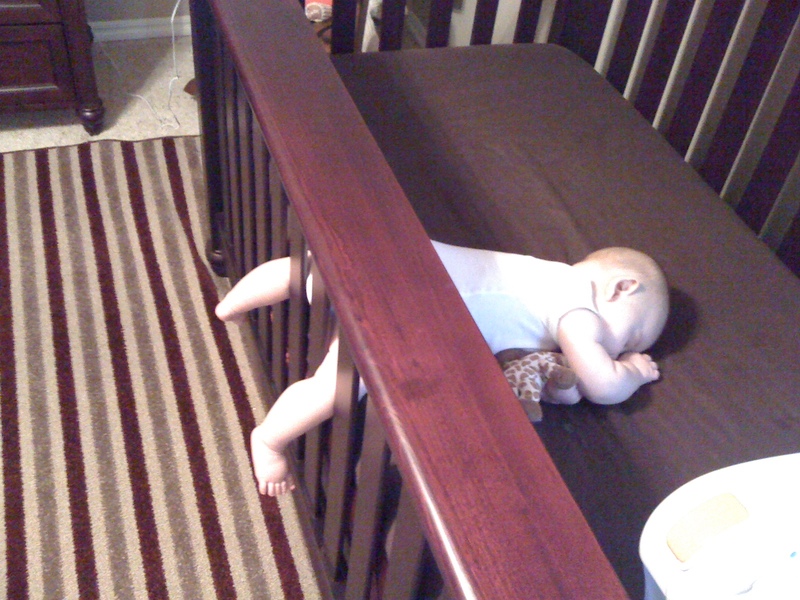 Then I left him in our bed next to a sleeping Luke and went to change his crib sheet. I normally leave this horrible task to Luke but he was fast asleep and had a big day ahead of him (more on that later) so I decided to tackle the impossible myself. Have you ever changed a crib sheet? It is equivalent to running a full marathon. It is hard, exhausting and leaves you sore by the end of it. By the time I got that beast of a sheet on the mattress I was wide awake. I went back to get Eli to put him in his bed but he was fast asleep. He look so sweet and peaceful and I felt bad moving him (ridiculous I know) so I left him in bed with us. Since I was wide awake I used this time to browse the internet AKA creep people on Facebook. It's amazing the things you can learn about your former high school classmates at 4:30 in the morning. 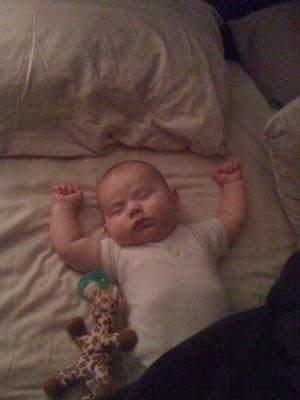 So I decided it was time to carry sweet sleeping love-bug who was taking up the WHOLE BED to his crib. He stayed asleep and I fell asleep around 6:00. Eli woke back up for the day around 6:30. Beautiful. It's a good thing I know who is pregnant, divorced or just crazy now. Those are the things that keep me functioning everyday, not sleep. Who needs sleep? Shifting gears....today was Luke's very first day as a middle school teacher. This is a new season of our lives and we are excited about it. It happened kind of unexpectedly and randomly, but we felt like God was leading Luke in that direction so off to school he went. I had the best of intentions to get up and take a picture of him before he left for school for the first day but I had been up working hard on Facebook all night and didn't even hear him leave. I'm happy to say that this new job has brought us closer together. Tuesday night we worked together on getting his classroom rules together and argued no more than 20 times in a 5 minute period. Luke kept saying "THIS is why we could never work together" which I thought was strange cause I'm pretty sure we already work together in a little thing called LIFE. Luke said his first day was great and the kids thought his classroom rules looked the best. Actually I made that part up but I'm sure if you asked them that's what they would say. He also said there is already some rumor about him and his beard going around school. Interesting. I've known him for 8 years and never once thought about making a rumor about his beard. Actually I didn't even know he had a beard. I need to look closer I guess. Obviously we are having fun with him transitioning into this new role. Well it's 10:00 so I better hit the hay. I have a date with Facebook around 4:30. If you aren't on there at that time you are missing out. Please ignore the bags under my eyes. You should be forewarned, this is another one of those "being a mom is the hardest job on the earth" kind of posts. But for real, it is the hardest job. I mean obviously people told me that before I was even pregnant, but I didn't believe them. I thought they meant it was physically exhausting or something like that. But nothing could have prepared me for the mommy guilt or the constant lies that our feeble mommy brains are pelted with on a daily basis. And on Monday night I faced a case of mommy guilt. Last week I was invited to a bible study that occurs every Monday night and from the time that I was invited I planned to go. And then Monday night came and I started to doubt everything. All day Monday I had every intention of going to this bible study, I figured out how much time I had to leave work, get Eli, cook dinner, change clothes, and play with Eli before I headed out. It was all perfected to a science and was ready to be put into action. That was until I picked up Eli and saw his sweet little love-bug face. I was then thrown in a a fury of questions, doubts and guilt all swirling around in my little brain. Side note, did you know your brain is the size of your two fists placed together? I have small hands therefore I have a small brain. Anyways, leaving Eli for a couple of hours that night really wasn't that big of a deal, but in my mind it became The. Biggest. Deal. Ever. This is where my mind went downhill and I began to question everything in my life. It all started with whether I should go to bible study or not and basically boiled down to what came first, the chicken or the egg? My mind was clearly out of control. I kept asking myself...what kind of mom would it make me to leave my child AGAIN after I was gone from him all day long?? But I wanted to go. And then that made me feel guilty that I was actually ok with leaving him. But then I wasn't ok with leaving him and thought there was no way I could go. But then I thought "well I do want to go" and so the viscous cycle continued. My poor mind was spinning and went back and forth as to whether I should go about 2 million times in a 20 minute span. Eventually I decided that it would be ok for me to go. And then I got in the car and I had a meltdown. I tried calling two friends. I wanted them to tell me that I wasn't a bad mom for leaving Eli. I needed affirmation. So then I called Luke because I wanted affirmation from him. At this point I was pretty positive the rapture had happened and I had been left behind. But there weren't cars swerving off the road and planes weren't crashing around me so I thought maybe it was just a fluke thing that all three people I called didn't answer. And instead of gaining affirmation from other people, I decided to spend that time with God and just release all the thoughts in my mind to him. I really am trying to do the best mom and wife I can be, while still doing the things in life that I need and want to do. And like I've said before (204920 times?) I'm trying to balance it all. Correction: I'm learning to balance it all. It's not easy and some times I feel like I have it figured out only to have a meltdown and take five steps backwards. But I'm learning. I promise one day I will quit talking about balance, and guilt and being crazy. But for now this is the season I'm in. I hope one day I look back and think "wow I was a complete SPAZZ" cause that will mean I came out on the other side of it and learned from it. And until I figure it all out feel free to tune me out. Even I'm annoyed with myself! But at least I know there are other moms out there that can relate. And that is a good feeling. Four years ago I created this blog for no particular reason other than the fact that I had been reading some blogs on the internet and I decided that I wanted to start my own to document my life. I figured I would either be getting married soon, OR I would be breaking up with my then boyfriend because he wouldn’t propose, so either scenario would create good blog stories. It seemed that I would have enough material for a good year or so. I had no idea that I would still be blogging several years later with no intentions of quitting anytime in the near future. With all that said, shortly after I started blogging I saw a blog post by an older male who talked about female blogs and how they only blog about their life. He went on to say that this type of blogging by females was completely vain and the most prideful self-indulgent thing a person could do. I'm sure you know what is coming next.....true to form I began freaking out that my blog was vain and did I really need a spot on the internet to talk solely about my life and all that it entails? I mean sure my breakup with my boyfriend, or hopefully wedding stories would be entertaining to myself but was it completely vain to write it all out on the internet for other people to read? I really struggled with this and went back and forth as to whether I should continue with my blog. I had journaled on various other sites on the internet prior to my creation of “The Life and Times of Megan” blogspot (that was my first blog name, creativity is not my strong suit), but after reading that post by that man (who I now picture as a grumpy and bitter man and obviously had a very blog) I sent myself into a tailspin of doubt and worry about possibly being vain. Ultimately I decided that I was blogging for me. I enjoyed writing and using that creative outlet and it would be an added bonus if some of my friends and/or family read it. I never really thought anybody outside of people I knew in real life would read it. I can still remember my first few blog comments from other bloggers. It was like I had won the lottery. I was freaking out more than I should admit. I’m still friends with those first few commenters, which in itself is so cool and is a testament to the fact that blogging goes way beyond what those outside of this "world" can see. These are real relationships, real friends, and real emotions. However, still after four years, that man's post is never far from my mind. In fact I like to think that it holds me accountable. I think of it often and it helps me to reevaluate my blog and what my purpose for this little corner of the internet. Clearly, it is important to me because I take the time out of most days to come on here and share crazy and sometimes pointless stories. But why? Obviously one reason is because I want to journal my life and retell the stories of our lives that otherwise might get lost in the mix only to be forgotten years from now. I mean obviously when we are 80 we will want to remember the time Luke called me a giant. Good times people. I think it is always good to reevaluate why we do what we do. Maybe one day I will step back and know that it is time to take a break form blogging, or maybe I will still be blogging when I'm 80. Will we have robots that clean our house by that point? Please say yes. After reevaluating I can that my purpose for this blog is to be myself, to tell silly stories, share random facts, record my baby's growth, record my crazy mom freak out incidents, form friendships, gain wisdom, glorify Christ, journal conversations between my husband and I, seek advice, and basically try to be the best blogger that I can be. And that in a nutshell is my blogging purpose. Eli Tree is 5 months old. My sweet baby is the absolute light of my life. From his facial expressions to his vocal "announcements" all the way to watching him learn to work his tiny little body I am loving ever minute of this stage. - You are trying your hardest to scoot across the floor. Right now your rolling and rolling everywhere. You get up on your legs and try and push yourself across the floor. You will be taking off in no time. - You are quite the talker. You love to shout at us! And we love when you shout at us! - You have started sleeping from 8:00-6:00 and we are so happy. The transition with me going back to work and you moving to your own room was rough for a couple of weeks but we seem to be in a pretty good routine for now. But I've learned with sleep ya never know! - Taking naps however is just not your thing. You will sleep around 30-45 minutes on a good day and then wake up refreshed and ready to go! You take a morning and afternoon "nap"
- You are doing so well at childcare and they love you there! - You have become a chunky little guy. Right now you weigh 16.8. Considering you started out so tiny this is very big to us! - You had your first non-family babysitter this month and you did great! - You've started eating rice cereal and you aren't the biggest fan. You will eat it, but you prefer the bottle. Eli you are so fun and like I say every single day I am so thankful for you. Your daddy and I fall in love with you a little bit more every single day. This past weekend was a great one. Friday night we hung around the house. I cooked chicken enchilada's and Luke and I watched The Fighter after Eli fell asleep. It was an excellent movie. I'm definitely not a romantic comedy kind of girl. This movie was right up my alley. Saturday I had a meeting early in the morning and then a baby shower in the early afternoon so I was gone most of the morning and afternoon. Luke's parents came up to spend the day with Eli so I knew he was being entertained at home. Sunday I worked the nursery at church and Eli ended up being the only baby in my room. So I got to play with my baby all Sunday morning. After church we went to lunch with friends. It has been awhile since we went out to eat with friends so we really enjoyed our time. I need to get to bed now, Monday mornings always come really quick and I'm usually running around like a crazy woman! 1. Tuesday night we had the craziest storm come through our town. We woke up around 2:00am to the scariest sounds and no power. The wind was blowing so hard we were pretty sure some of our trees were going to fall over or our windows were going to bust. We brought Eli in our room to wait out the storm. Eventually the storm calmed down and we went back to sleep. We still didn't have power in the morning so getting ready for work was interesting. The effects of the storm can be seen all over our town, trees are down everywhere, trampolines blown in yards, signs snapped in two, it's all pretty crazy. 2. Our town has a new outlet mall and I went to it for the first time today. I'm in love. I've ALWAYS wanted an outlet mall in my town and I have one now! Yay! Gymboree outlet and Gap outlet?? YES PLEASE. 3. When Eli was born all of my nephew's clothes were passed down to us for Eli to wear. I was so pumped that I didn't need to buy any baby clothes for necessities, only outfits that I just HAD to have. 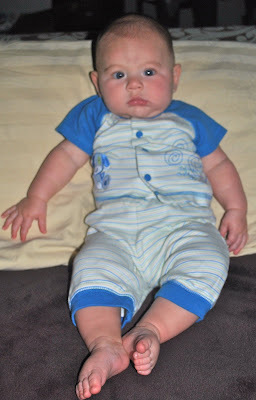 Well I am sad to say that Eli has outgrown those clothes. My nephew was in 3-6 month clothes in the winter and Eli is in 3-6 month clothes in the middle of the summer. Hopefully one day it will come back around and the seasons and sizes will line up but for now they just aren't. Yay for that outlet Gymboree and Gap! 5. I went jogging tonight for the first time in a month and it felt so great. I now consider myself a "runner" because if I don't go running I really miss it. I think it's time to tackle a 5K for sure and then make bigger running goals after that. I love that it has become something I enjoy and not just something I feel like I need to do. 6. Each morning I spend a fair amount of time washing and drying and straightening (sometimes curling) my hair. Wednesday morning when we didn't have any power I didn't even really look at it. I put a comb through it and put it halfway up and left the house without a glance in the mirror. I got so many compliments on my hair that day. The day I spent less than 2 minutes on it. Go figure. Sidenote about pajama day. I can remember pajama day in high school and I would go buy cute new pajamas to wear. Doesn't that defeat the purpose of the pajama day? I almost did the same thing with Eli until I realized that would be ridiculous. And Luke said no. 8. I need a pedicure in the WORST WAY. We are on a strict budget LOCK.DOWN. this month so this is a no go. Luke has told me to wear close toed shoes until September if I think my toes look that bad. I won't tell you what I said in response to that. 9. I think I might be becoming a shoe girl. I've never been a shoe girl but I find myself drawn to shoes more and more. Of course it happens in the month of BUDGET CRACK DOWN. I blame Trina! 10. I miss diet coke. I don't miss the way it makes me feel. I get so bored with water I need to find something else good to drink. Right now in my life I have lots of little goals. Luke and I are very goal oriented and we like to write out our short and long term goals for ourselves and our family. But in order to manage my goals I need to get my life in order and right now I feel like I am scattered everywhere and have no grasp of what I am doing. This feeling isn't new. I can remember throughout college feeling like I was so off balance and couldn't get my head on straight. Which is obviously incredibly funny at this point in my life because looking back I can't imagine it was very hard to balance a life of eating as much Taco Bueno as one week would allow, while hanging out with friends, trying to dominate Tetris on the original nintendo, staying up as late as possible and occasionally doing homework. That paragraph makes it sound like my college time was lame. It really was awesome and fun. Very G-rated compared to the average college student, but awesome and fun all at the same time. So clearly no matter what is on my plate I find it hard to balance it all. And I know from here on out life is probably only going to get busier. Adding one child to our mix sped things up to lightning speed, I can't imagine what it will be like one day when we add another child and then all that life entails after that. With that said, it is imperative that I learn how to balance life now. I feel like I am constantly one (or two or three or four) steps behind. There is always someone that I need to call, someone to meet for lunch, an email to return, laundry to be done, a house to clean, groceries to buy, a bible to be read, a body to get in shape, a husband to spend time with a baby to play with, dishes to wash and of course I could go on and on. I'm not complaining about all that I have on my plate, because I am thankful for a full life, but I really need help in prioritizing and managing it all. When I went to my Scentsy convention last week one of the speakers spoke about how when you do something for 21 days it becomes a habit and starts to become apart of your routine. He encouraged us to do something for 21 days such as working out or meditating for 2 minutes in the morning or sending someone an encouraging note everyday for 21 days. That would be 21 different people for 21 days not the same person for 21 days. That would probably get really creepy. I was so pumped about this and had it all planned out as to what I was going to do for 21 days. I committed to myself that I WOULD do it. And then got home and did not do it once. It's not that I don't have time. I can find five minutes of my day to sit and write a note to someone to encourage them or 15 minutes to read the Word and spend time with God, but my prioritization is all off and sadly I do not always make time for those things. So that is what I'm working on now. I don't have a fluffy ending that wraps everything up and explains how I learned to prioritize and boasts that I've got it all together now, because I don't. But I DO want to get it all together. I don't want to be a person who constantly complains about having too much to do, because that is not the problem, prioritizing is the problem and is something I feel convicted about quite often. I have obviously found time in this day to sit down and write this blog post, but I still haven't exercised, or vacuumed or spent adequate time with God. Three things I planned to do today. And have now been set aside for tomorrow. Again. I want to make an active choice to prioritize everything in my life. Maybe someone out there has a suggestion as to how to do this? Or maybe you just want to whine alongside me? Go right ahead. Hopefully I will be back here soon writing a post about how I have learned how to balance life and prioritize everything on my plate. If only that plate consisted of Taco Bueno and playing Tetris. Such a strenuous time of life. I'm not sure how I managed. In the middle of the winter when I am constantly freezing and can't seem to get warm I make a vow to myself that I will never EVER complain about the heat once it comes. So that is why I'm sitting in 113 (seriously) degree weather with a forced smile on my face. But even though I can't go outside without feeling like I just walked into an inferno and when I drive with the window down I feel like I'm walking through a blow dryer, I still know that I would rather be hot than cold. It's just how I'm wired. Plus I like the feeling of hot denim better than cold denim. When I get in a cold car in the winter and the seats are freezing I feel so uncomfortable in my jeans. The cold denim feels weird on my legs, but when the denim is hot, I don't feel that uncomfortable. Something that might be equally as weird as cold denim is the fact that I consider myself a seasonal eater. I have certain foods that I group into summer food or winter foods and I only want them in their appropriate season. However, I must say, just because a food is hot in temperature does not necessarily mean I consider it a winter food. Crock Pot chicken = summer food. Crock pot chicken has become my "go to" recipe for the entire summer. Also known as the summer that I just had a baby and don't have the desire to cook big meals that take lots of mind power. Mind power is at a minimum these days. I simply take some chicken breasts, put taco seasoning on them, pour a jar of salsa over it all and and cook for about 4-5 hours and BAM, crock pot chicken is born. Hopefully Luke never grows sick of this because I intend to prepare it A LOT. So the other 2 days of the week when we aren't eating crock pot chicken (I made that name up by the way) I like to find a cool summer type salad to eat. I got this particular recipe from the Kraft website and Luke loved it. Mix dressing, seasoning mix and lime juice, add to salad, toss to coat, add cheese and cilantro, mix lightly. Obviously I'm not a big fan of cheese. This salad is wonderful and goes along nicely with crock pot chicken. I have several other summer time meals I will share soon. Is anybody else a seasonal eater? Is that weird? And just in case you were wondering Sandwiches and Spaghetti are neutral. They can be eaten in any season. It all makes sense in my mind. Last week I went to Fort Worth, Texas Wednesday through Friday for a Scentsy convention. I had mixed feelings about going. I was excited to go and spend time with friends and learn more about the business that I'm involved with, but I was also extremely sad to leave Luke and Eli. I missed them both so much but Luke made sure to send me lots of photos of our sweet little guy that melted my heart each time I received one. I wanted to go through my phone and kiss his sweet checks. This was my favorite picture that Luke sent shortly after he had sent a picture of Eli crying. Obviously he just needed a little food to make him feel better (and probably his momma). He is becoming quite the chunky little guy. Without getting too personal, I will say that being gone for two days was not good for my "supply" and Eli is now completely on formula. This was pretty hard for me and I shed lots of tears over this. I'm happy that I was able to breastfeed for 5 months but I had much longer goals in mind. Eli is doing just fine on formula and has adjusted well. So, as long as he is ok I will be ok also! I am beyond thankful that I not only found an amazing husband, but also so thankful that my husband is an amazing daddy. Would you please take a minute to pray for my friend's son Caden. I met Becca through blogging several years ago and developed a friendship with her through blogging and emails. The life she and her husband have built is so inspirational and one that completely reflects the heart of Christ. I met up with her in Atlanta last year and she is just as sweet as she appears on her blog. Last week their baby boy Caden was born and shortly after birth they discovered some heart problems. He had open heart surgery today and is in recovery now and needs our prayers. Please take a minute to pray for them and even leave a note of encouragement at their blog. They are reading comments to Caden while he recovers. At the beginning of July I made a personal commitment to blog everyday. Does anybody remember July because I sure don't. It seriously flew by. I had lots of blog post ideas in my mind, but those are long gone. So now I commit to blogging more in August. I had so many stories I wanted to tell to remember and just completely let them slip away. I blame the heat for the reason I haven't been blogging. Who can blog when it is 110+ degrees every single day?